Today has been much cooler, with wind and rain. On our walk today, in the rain, I picked a handful of daffodils that were flopped over, either from the rain or from being trampled by four big white feet. even as a puppy, could not resist the pretty yellow flowers. Do you remember back in December of 2016 the big mess I had around Christmas time, trying to make a batch of peanut brittle?? Oh, I did a big post about it! and how I swore never to try again!! and how the recipe I used was called, "no fail" peanut brittle!! Would you just look at this!! (don't look at the old stained up, beat up bread pan). The peanut brittle turned out perfect!! Poppy says it's because he had a hand in making it this time. It's really good too! Really good!! Dumper had just finished half a can of his special kitty cat food, and stretched out on the bed in the sewing room. He and Bickett both enjoy listening to Bluegrass music while I sew. Seriously! I've been away on a little vacation! Sorry I left with telling anyone. Yep, early Sunday morning, I drove all by myself waaay up into Virginia to visit my daughter Andee. It was sure nice to get away, and even nicer having a couple of days with Andee. These sweet little bun bun dishes are a gift from Andee. I just love them! She is always buying me something with bunnies. She is a sweet sweet daughter. Somebody let the ball roll under that heavy china cabinet! Hang on, Bruno said, I think I've got it! Andee and I went to all our favorite shopping places and also a couple of thrift stores...oh, it was fun!! These birds were beautiful and this tree was filled with them, but by the time the idea hit me to take a picture, lots of the birds had scattered. Of course! Me, always a day late and a dollar short! 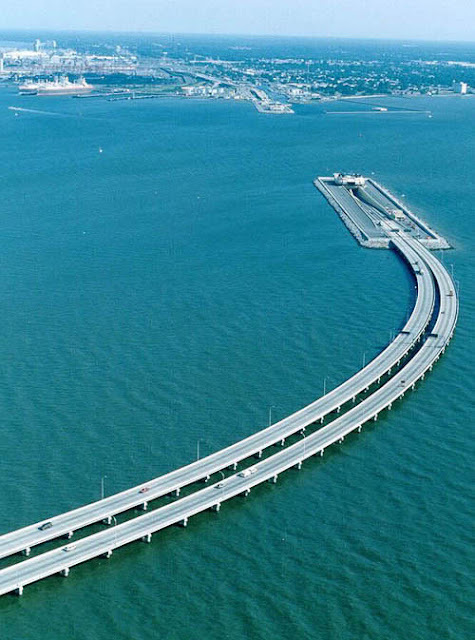 Friends, you know that driving alone up to Virginia, meant crossing that Monitor-Merrimac Memorial Bridge-Tunnel all by myself! It was scary. But even scarier, was driving home alone. There were heavy fog warnings all along the way and friends, as we emerged from the tunnel, going up on the bridge, the fog was so dense that all I could see were the tail lights of the car in front of me. I was sure hoping and praying, there would not be a wreck, on that four and half mile bridge, over all that water. and once again, all's well that ends well! About half a day of sunshine maybe twice a week is all we're seeing these days. Yesterday was one of those sunny half days, and warm too. Poppy said, what do you want to do...finish blowing those leaves, or split and stack the rest of that wood up near the garden. Let's do the wood, I said! First, have you ever tried to split a Sweetgum log? It will beat you to death! Even the heavy steel wedge made only a small split in the log. and finally the wedge broke free, but the log was far from being split. He hammered the wedge into the side of the log. The grain of a Sweet gum goes in all directions. Our half day of sunshine was used up on this one log. One log!! Well, we did split one other short piece...just to say we got two of the pieces split and moved to the back porch. Poppy had warned me that splitting this Sweetgum would not be as quick and easy as the maple we split and moved a week or so ago. I can remember mama talking about chewing gum from the Sweetgum tree when she was a child. In the old days youngsters throughout the rural South went to the woods, not the grocery store, for their chewing gum. There they sought a tree with unusual star-shaped leaves, and bark resembling alligator skin. From it they pried off, then popped into their mouths, yellowish brown balls of a fragrant, resinous substance with a licorice-like taste. This treat was the sap of the native Sweetgum tree (Liquidambar Styraciflua). Thank you for coming along on my boring wood chopping post. So many sweet Valentine's Day posts, and I have nothing in mind. Wait! Be back in a minute. I'm going outside with the camera. Maybe something heart-shaped will turn up. I really didn't expect anything special, but look! My sweet Valentine! to say "Happy Valentine's Day!! Well, it hasn't rained as much this weekend as the weatherman predicted. We did get a shower or two early yesterday, but the rest of the day was just cloudy. This morning at 5:30 when Eli, Weetie, and I went out, the temperature was 67 degrees. Is this not still February!!! No complaints here! Look who else was out early. Was this a thirsty cat, or a trick? "Come on fellas, don't be frightened, there's plenty of room for the three of us". Smokey is a hunter, that's for sure, but there were no Cardinals bagged today. Nope, he came on in the house and went to sleep. All the animals seem to like the new rug, of course! Every morning I get up afraid of what I might find on that new rug. Are we the only folks with cats that throw up?? No one ever talks about it, so I've been afraid to mention it. Actually, Smokey has never ever thrown up...but the other two! Oh my gosh! Dumper throws up hairballs. Bickett throws up just because he can. He knows I'll worry that he may be hungry again, since all his food ended up on the floor, and open another can. Here's a hint for cat owners...Cereal boxes! Especially the nice stiff ones like Wheaties and Grapenuts. Any time we empty a box I cut the front and back into four squares and keep a stack of the squares in the laundry room. Two pieces of cardboard and a plastic grocery bag is perfect for cleaning up messes, even on carpet. Just go with the grain and it comes up perfectly. Then clean the spot. These cardboard squares also help with the litter box. Why, I don't think Bickett has ever wet in the center of the litter box. It's always on the side, covered in clumping litter. Yes, I am talking about you too, Dumperoo! so I walked outside to see his face. Silly kitty! These are not the greatest pictures but all I've got. Hope you're having a good Sunday. Thank you for looking at the dolls, and I do appreciate the nice comments. I've added them to my silly little shop. of course, I've never been in style in my entire life. This is me wearing my latest pantaloons. These have wider legs than the others I've made. I love wearing them with an apron, especially those new cross-back aprons that look cute with a tee shirt underneath. 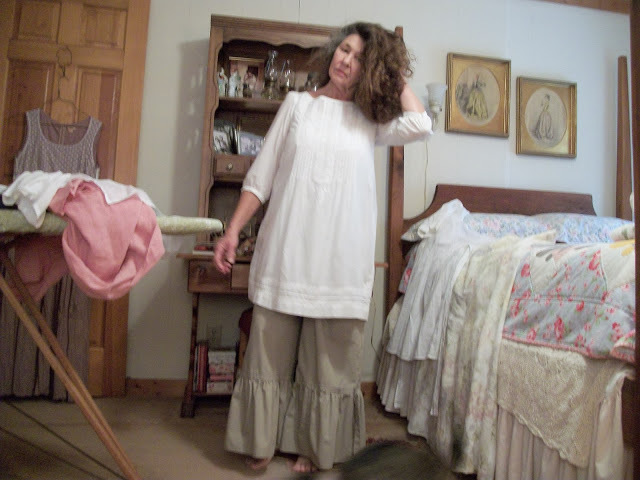 and me again, a few years ago, wearing the old faded green pantaloons...showing off my new perm and trying to look, well, not so old. I've practically worn these out. Her beautiful clothes are all linen too. I use a small piece of muslin cloth, stuff it with cotton, and sew it over the head piece. and sew on a skirt, a square for the blouse, and then make the two fabric arms to match. and I use a little hot glue to hold it in place for a ponytail...make the apron and bonnet, and then the scary part...drawing on the face, after all this time spent making the doll! Finally finished that little bunch of dolls I've been working on. and all of them wear pantaloons. If only I could draw a prettier face. Wish I had kept a count of how many stick dolls I've sold, especially a few years back at the Wake Forest Farmer's Market. My best customers were the home schooled girls, especially when they were reading "The Little House on the Prairie" books. Saturday mornings some of the girls would bring their dolls with them back to the market and hang around with me while their moms shopped. It was fun to see a little girl wearing a bonnet, and playing with one of the dolls. It was fun. I've wished many times that I was still selling at the market. I had all intentions of cutting another sapling today, but spent the whole day working in the house. Having that new rug made everything else look old and dirty. anyhow, I'm dying make a few more dolls. I suppose making these silly little dolls would be my favorite crafting project. Oh, and I am adding these dolls to my little shop...haven't had any there yet. Thanks again for visiting. Poppy needs the computer so I'll be finishing up now.